Supertall towers of 1,000 feet or more, until now seen mainly in the Middle East and Asia, are coming to the U.S., with one proposed for Seattle. Developers are responding to demand for city living, skyrocketing downtown rents and ready capital from elite global investors. To be counted among the world’s great cities these days, it appears size matters. Dubai’s Burj Khalifa holds the title for the world’s tallest building, at 2,717 feet high, but Seattle may join the club of global cities with a tower soaring 1,000 feet high. Miami-based Crescent Heights, a national condominium developer, has filed plans with the city to build a 101-story tower that would reach 1,111 feet above ground level, making it the West Coast’s tallest skyscraper. 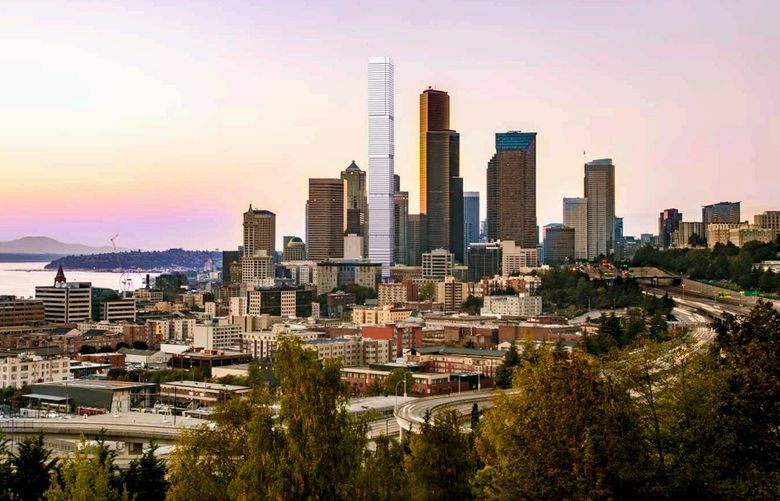 Once completed, it would be nearly twice as tall as the Space Needle and overtake the neighboring 933-foot-tall Columbia Center as the tallest building in the Pacific Northwest. From Manhattan to Los Angeles, developers are building supertall towers that up until now were built mainly in the Middle East and Asia. They’ve been emboldened by insatiable demand for city living, skyrocketing downtown rents and ready capital from the globe’s wealthiest investors. Last year, developers completed a record 11 supertalls worldwide that were 984 feet high or greater, and this year and next are expected to set records, according to the Council on Tall Buildings and Urban Habitat, a skyscraper-tracking group. It’s no accident that eight of the 11 supertalls under construction in the United States are in New York City, where real estate has seen an influx of capital from the globe’s elite. Philadelphia, Los Angeles and San Francisco each have one skyscraper under construction. Crescent Heights’ proposed tower, “4/C,” would become the nation’s 19th-tallest tower among skyscrapers completed, under construction or proposed, according to the Council on Tall Buildings and Urban Habitat. The proposed tower would be on the west side of Fourth Avenue between Cherry and Columbia streets. At 7 p.m. Tuesday, Crescent Heights is scheduled to present its plan to the city’s design review board at a public hearing. The tower would be composed of a 150-room hotel and six floors of offices, with the upper 83 floors dedicated to about 1,200 residences, according to plans filed with the city. The tower’s height could impact flight paths to Boeing Field and Harborview Medical Center, according to an initial notice from the Federal Aviation Administration. Crescent Heights says it’s confident it can win FAA approval. With giant towers come giant headaches: On windy days or with seismic activity, such structures can sway a few inches. If hit by 100-mph gusts, the towers can bend as much as 2 feet. 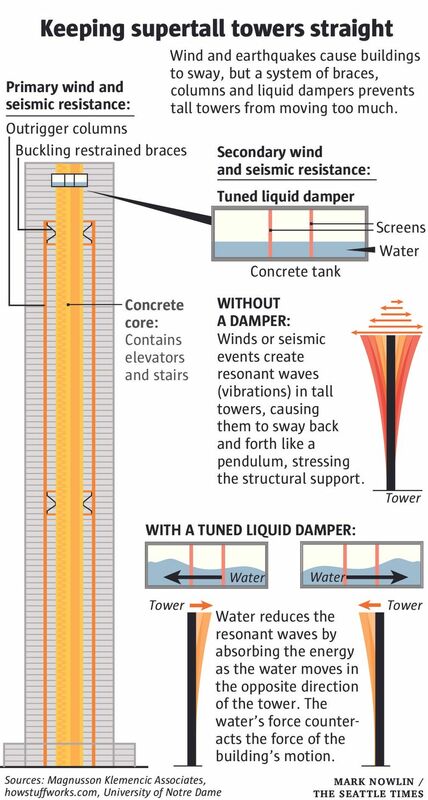 To help counteract the tower’s swaying, Seattle engineers at MKA devised a simple solution — giant water tanks known as “tuned liquid dampers” mounted at the top of the building. As a tower bends in one direction, the water in the tank sloshes in the opposite direction, counteracting the swaying of the tower. Liquid dampers will be installed in the 58-story Rainier Square Tower being developed by Wright Runstad as well as Crescent Heights’ 101-story 4/C. The main physical limitation on how high a tower can go is the width of the structural bracing system at the base. Engineers talk about a building’s “aspect ratio,” which is the building’s height divided by this width. Manhattan’s slender 432 Park Avenue is 1,396 feet high and has one of the highest aspect ratios, at 18, Klemencic said. While Crescent Heights’ 4/C will soar to 1,111 feet, its aspect ratio of 10 makes it typical of most tall towers being built in the U.S. today. In some ways, 4/C is symbolic of both its developer’s drive and where Seattle is headed in terms of wealth. Crescent Heights’ chairman is billionaire Sonny Kahn, who along with two partners began developing in Miami in the late 1980s. The partnership expanded to New York, Chicago and Los Angeles, and it has a reputation for developing luxury condos and, in the current climate, apartments. The family-owned, privately held company said in a statement that it is known nationally “for creating sustainable environments while minimizing our overall carbon footprint,” and that it wants 4/C to be “a vertical neighborhood” that’s active all week, day and night. There are plenty of examples of proposed skyscrapers that didn’t get financed, said Jason Gabel, a spokesman for the Council on Tall Buildings and Urban Habitat. “They’re even more prone to financial downturns,” he said. Financing the tower doesn’t seem to faze Crescent Heights, which says it’s a long-term investor in its communities. A key piece of the equation: Supertalls are meeting demand from the world’s ultrawealthy, who want to park some of their money in exclusive enclaves — and it doesn’t get more exclusive than the sky. According to 432 Park Avenue’s website, units are selling from $17.2 million for 3,575 square feet to $76.5 million for 8,055 square feet.